I live in a connected world. I’m connected by an umbilical cord of technology to the wider world (outside of my immediate social circle), by landline, smart phone, laptop, and desktop. Cyber criminals however, are not content to let me stay connected, using these technologies, without attempting to profit through one scheme, or another. I’ve taken the necessary steps to make it as difficult as possible for cyber criminals to target me either directly, or indirectly, by protecting my personal use technologies using both software, and hardware devices. To this point (and I’m keeping my fingers crossed), I have not been victimized. Never for a moment however, have I considered that an automobile fit into my definition of a connected device. It just shows that even a technologist can occasionally be behind the converging technologies curve. Ford Motor Company though, has acknowledged that the paradigm has shifted, and that we are connected to our cars, as never before. Moreover, the car itself is now connected to the wider world through both current, and emerging technologies. Consider – smart phones to-car connections (a gateway to the “cloud”), and WiFi, (just two examples). Ford, recognizing this paradigm shift, has just announced its second generation Sync technology will be available later this year in the 2011 Ford Edge and 2011 MKX Lincoln, with a later release date for the 2012 Ford Focus. The technology will be driven by Microsoft’s Windows CE operating system which will include a built-in browser and secured WiFi access. Cybercriminals however, don’t care if the target under attack is sitting on a desk; being held in a potential victims hand, or cruising down the highway at 100 kilometers an hour (60 miles an hour in America). To address the security issues, Ford has built in safeguards in the form of a suite of security features, to protect Ford owners from the threat of computer hackers and viruses. SYNC Firewall: With the launch of MyFord Touch for the 2011 model year, Ford is adding WiFi “hot spot” broadcasting through SYNC using a USB-connected broadband modem. To prevent unauthorized access and combat piggybackers, Ford has built in firewalls to both the wireless network and the vehicle. Using the SYNC WiFi system, a signal will be broadcast throughout the vehicle. Default security is set to WiFi Protected Access 2 (WPA2), requiring users to enter a randomly chosen password to connect to the Internet. When SYNC sees a new WiFi device for the first time, the driver must specifically allow that device to connect, preventing piggybacking on the SYNC-provided signal. SYNC Phone Pairing Protection: The one-time pairing of a phone to SYNC is a simple process through Bluetooth wireless connectivity technology allowing up to 12 cell phones to be recognized by system. The short-range nature of Bluetooth technology makes SYNC’s connection to a paired cell phone’s stored information – contact lists and address books – possible only when the phone is inside the vehicle. If there’s no phone in the cabin, the wireless connection is broken and there’s no evidence of stored data for invaders to collect. Encrypted Jukebox: Ford’s onboard “Jukebox,” which allows customers to download music onto a hard drive, has built-in digital rights management and encryption features. 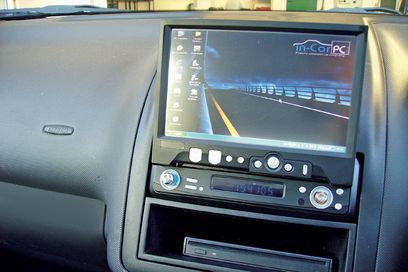 The encryption is unique to each navigation unit, which means the hard drive can’t be removed, inserted into another vehicle’s navigation system and accessed. In addition, hackers can’t access the drive from another computer and enjoy those favorite tunes. Customers don’t have to worry about someone hopping in their car sight unseen, plugging in a USB stick and doing a quick download of their personal music library, either. The Ford proprietary encryptions protect any songs saved to the system’s digital jukebox – which can hold up to 2,400 tracks – from being moved or copied to another device. “Home” Protection: Ford also gives customers with voice-activated navigation the ability to protect their programmed destinations and addresses – such as “Home” – from unauthorized eyes. A valet mode can be engaged on the system that locks all programmed destinations from view unless a 4-digit PIN is entered with each ignition key cycle. MyFord Touch will also offer a valet mode. Engine Immobilizer: To help protect the vehicle, the mobile hub for all this personal information, Ford depends on SecuriLock. This patented passive anti-theft system prevents the engine from starting unless a coded ignition key is used. With SecuriLock, a wireless radio-frequency transmission is required to transfer an electronic code between a transponder in the key to the vehicle’s ignition system. There are 72 million-billion possible codes so every Ford vehicle sold worldwide for the next 10 billion years will come with a unique code. Securicode keyless entry. The Ford-exclusive keypad gives customers the ability to lock their key fob in the car if they desire (consider not having to worry about losing the expensive fob when biking a mountain trail, sunning on the beach or jamming at a rock concert). Securicode works on a secure 5-digit code. The latest iteration of the keypad employs similar touch-sensitive technology, processors and algorithms used by the iPod and iPhone. Ford Motor Company, a global automotive industry leader based in Dearborn, Mich., manufactures or distributes automobiles across six continents. With about 198,000 employees and about 90 plants worldwide, the company’s automotive brands include Ford, Lincoln, Mercury and Volvo. The company provides financial services through Ford Motor Credit Company. For more information regarding Ford’s products, please visit www.ford.com. Next they will be putting protection on the refrigerator and washing machine lol. Unbelievable. When I was writing this I gave myself a headache, I was shaking my head so much. I think you’re dead on re: the refrigerator and washing machine. What’s next – the toaster? Unbelievable is right. We’ve gone crazy! I have Microsoft Sync in my 2009 Mercury and have to admit I love it. Bluetooth sync my ipod touch and my phone is great. I just push a button on the steering wheel and say call home. I also like being able to put mp3s on a usb drive and putting in the port and pushing a button a speaking the artist I want to hear. It is pretty impressive in person. Now the new models 2011 will have many more features. I Understand Ford and Microsoft got it started in only 9 months. There have been updates made to it and all have been free to upgrade by the owner. I just thought you would like to hear from someone who uses it daily.